1 package (10 ounces) frozen chopped spinach, thawed and drained. I used about 3 ounces of spinach..it was a perfect amount. Preheat the oven to 350*. Lightly coat a baking sheet with cooking spray. I use my pizza stone covered with parchment paper. In a large , nonstick frying pan, heat olive oil over medium high heat. 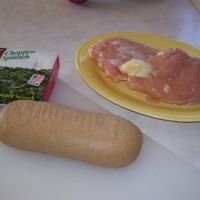 Add chicken and saute, turning occasionally until golden brown, about10 to 12 min. 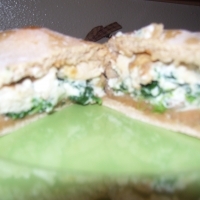 In a small bowl, combine the spinach, ricotta cheese, garlic, parsley, parmesan cheese and 1 of the egg whites. Mix until well blended, Set aside. 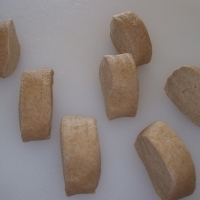 Cut the bread dough into 6 equal-sized pieces. 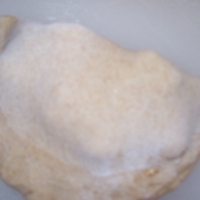 On a floured surface, press each piece into a circle. 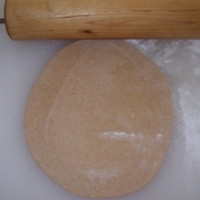 Using a rolling pin, roll each dough piece into ovals 8 inches long and 6 inches wide. 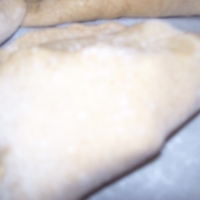 Brush the edges of the dough ovals with the lightly beaten egg white. 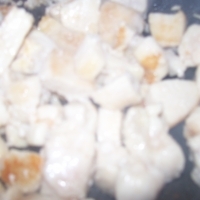 Place 1/6 of the chicken cubes in the center of each oval. Add 1/6 of the spinach mixture to each. 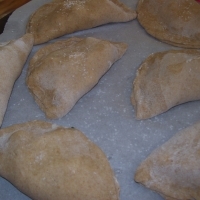 Fold the dough over the filling, pressing the edges together. Crimp with a fork and place on the prepared pan. Bake until browned and crispy, about 15 to 20 min. Goes nice with a salad. Made it last night...Very Good! Thanks! I agree with all the high accolades you got on this recipe. I can't wait to try this version of it! 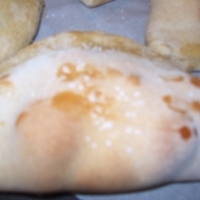 I also want to tell you about my new cooking group: Calzones, Stromboli and Handheld Meals. I will send you the link if you can't locate it. These look absolutely delicious! Your pics are very much appreciated and you more than deserve 5 forks on this recipe! Great post Michelle - love the photos. These look great, Michelle! I am saving your recipe to try - I love the flavor combination. Great post - thanks so much! Oh michelley, I LOVE the ingredients in these - and with the frozen bread dough, they would be so quick to make...gotta try - imagine it would be good with so many different fillings...GREAT post! These sound delish!!! I'm with jett2whit - excellent illustrations!! !